Welcome to the OTTERWASH, Findlay’s finest car washing facility. While we had a lot of fun with our name and logo’s, the one thing we are very serious about is offering you the finest, state of the art, wash possible. Browse our site and check out all the advantages of the OTTERWASH. I’m sure you’ll soon be “Crazy about the Otter” and join the legions of diehard “Ottermaniacs”. Today’s professional carwash is the smart way to clean and protect your car’s finish. The OTTERWASH is the only carwash to offer The Wash Card. With the Wash Card you can swipe your way to savings and enjoy the convenience of using a prepaid card instead of credit cards or cash. Join the Ottermaniac Frequent Washer Club and we’ll set up your very own Wash Card. The Wash Card is a great business tool for sales professionals and fleet accounts. They are also a great idea for friends, family, employee incentives and fund raisers. The OTTERWASH is absolutely the finest carwash in Findlay/Hancock Co. Here’s Why! Two D & S Super 5000 sizing automatic washers. Foam n Soft - Soft Touch Wash with the heel and Rim Blaster. The OTTERWASH accepts all four major credit cards, cash, coupons and the VIP Wash Card. Receipts are offered at the auto cashier for your records and accounting. No employees waiting for tips. 18 Vending selections in a clear view vend machine rather than the usual 3 selections offered at other washes. 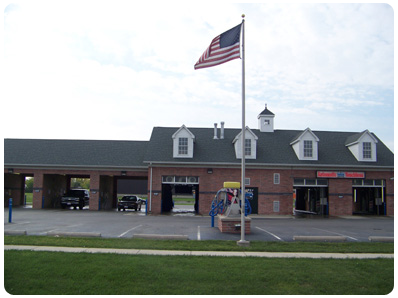 Over sized self serve bays - Our wash bays are 14 feet wide and 10 feet high. This accommodates larger vehicles. Self Serve bays are well lit from 4 locations in each bay. There are no shadows in low light situations that might mask dirty areas on your finish. Hogs Hair brushes are used on the foaming brushes in our self serve bays to allow the softest contact possible. These brushes are stored in a warm water well that keeps them pliable in the cold Ohio winter. No ice build up will scratch your car! The Otterwash is open when you need it. All bays are operational 24 hours a day, seven days a week for your convenience. All wash bays and service areas are well lit for night time usage. Pure drinkin water sold at our PureVend dispenser. At 25 cents per gallon this is the best buy anywhere for fresh drinking water! Your safety and peace of mind are of great importance to us. The OtterWash is the only wash that has in digital security cameras not only on the lot, but also in every wash bay and service area.